2.2 Can I transfer from another server? 5.4 How do I get around? 5.5 How do I level up? 5.6 How do I setup a Cure alt? 5.7 Why does my game crash when I try to load Cure Please? 5.8 How do I find out about weather? 6.1 What is different from retail / What is working or not working? 7.3 Help, I'm stuck! How do I get unstuck? 7.4 How do I change my character email or password? 7.5 Why did my party lose level sync? 7.6 Something is broken! What do I do? All Maps and Outposts Unlocked. Explorer Moogle 3 cities, Selbina, Mahura. Combat and crafting skills 9x Retail. Small regen/refresh/regain with buff to level 75. 9 Custom Abyssea zones With working custom ATMAs for EXP and HNM fun, all geared and balanced for 99 play. Custom Trials and Quests for Salvage and +1/AF3 +1-2/Empy/Relic/Mythic(and upgrades). Moderately buffed food… Nothing insane! Auction House is regularly restocked, but AH Bot also regularly buys items placed for sale and helps to simulate a higher player population. Please also note this is not intended to be an easy mode server. You will be expected to work for what you want as everything is designed to be achievable and thoroughly tested with the amount of players each mob is designed to be killed by. These are the game servers for the different dynamics of the game world. This contains the data structure behind the dynamics of the game world. There are plans for hardware upgrades in the future as things are needed, mainly RAM is the first planned upgrade if it comes to needing it but at this time it isn't. With the move to the new server hardware, you should see a major improvement on lag and speed of certain things like the loading the Auction House and such. Results from the AH should now be near instant. All players should click here to read the Server Rules. Can I transfer from another server? Server transfers are currently on hold while HomepointXI settles into its new home. Once the hold has been released, please see the Server Transfer Process guide for instructions on how to export your character and create a character transfer request. Yes you can run multiple accounts/characters at the same time, except in Dynamis and Limbus areas (serious bugs which can crash the server there). However you need to be aware that you will at random run into difficulties doing things like missions and quests while you do this. These are not mistakes in our server's scripts, but a side effect of the socket and session handling common to all FFXI private servers. Sometimes some of your characters will not have progress updated while others will, or one of your characters won't get a key item added. This will force you to repeat steps you already did, and possibly get your progress stuck until a GM can intervene. You can install either of the above tools via the Ashita Launcher under the Plugins section. The above links take you to the developer pages for these plugins. The developer pages contain information and commands for use at your disposal. How many players are online right now*? To start playing you will need to install PlayOnline, Final Fantasy XI and the Ashita launcher(Preferred) or Windower (be aware that most of us at HomepointXI are ashita folks, we're unlikely to be able to help you on Windower issues. Contact DSP for help, those are mostly windower people). Enhancements are 3rd party applications/plugins/addons that enhance the gameplay experience of Final Fantasy XI. Cut Scene Events may freeze when the game is not running at its stock frame per second. Workaround: set fps back to normal before triggering the CS event you are getting stuck on. Item Tool. Look up monster drop info, auction history, player bazaars and more. Character Tool. View character profiles including job levels, crafting levels, current equipment, auction history, bazaar items, and more. Monster Tool Search monster database for modified monster levels and hp/mp, item drop rates, respawn information and more. Blue Magic Tool. Find monsters and areas for learning specific Blue Mage Spells. Using the custom command !ah you can access the Auction house from anywhere in game! Certain items will be automatically purchased for a fixed price by the AH-Bot. For example, when you out level a piece of gear, you can sell it back on the Auction House. As long as the price meets the AH-Bot buy price, it will be bought by AH-Bot automatically. To find the AH-Bot buy price, look at the item's auction history and see how much AH-Bot is buying that particular item for. AH-Bot runs once every 1-2 days. You can have more than 7 items for sale at any given time. Note, do not check Sales Status or it will limit your ability to sell more items on the auction. Also note, this is considered a non-exploit-bug that you use at your own risk! Please see the server rules regarding the Auction House for further information. All Outposts are unlocked. Use the Teleporter NPCs around Vana'diel to travel quickly. Use a Warp Ring or a Black Drop to get back to your home point. Use Fields of Valor Field Manuals & Grounds Tomes together with a Chariot Band to maximize your experience points. How do I setup a Cure alt? Make sure you un-pause Cureplease after both accounts have been selected!!! !!!! !OPTIONAL STEP ONLY FOR IF YOUR VERSION OF CURE PLEASE INCLUDES THE ADDON .LUA FILE!!!!! Why does my game crash when I try to load Cure Please? These instructions are for Windows 10. 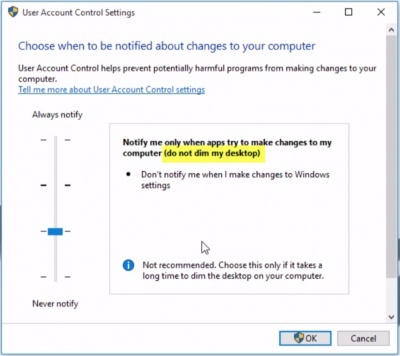 If you have any other version of Windows, the steps to get to the User Account Control settings may differ but all steps will end at same last step below (Step #5). How do I find out about weather? Use the weather reporter NPCs found around Vana'diel. This is useful when unlocking the Summoner job. What is different from retail / What is working or not working? Many Notorious Monsters (NMs) have been level adjusted (higher) and can drop custom items. Always check the HomepointXI Monster Tool to look for any modified levels and item drops! An example of an alternative method is to ask another player (that already has access to the destination/that is at the destination) if you can nexus to them and then secure a homepoint at/near the destination. Trusts do not currently work on any Dark Star Project (DSP)-based private server. On HomepointXI, you only have one limit break (Genkai) fight, the lvl70 fight against Maat. Once you have beaten this fight, you may then continue leveling all the way to lvl99! Only the original/advanced jobs can do this fight. This fight cannot be done on BLU, PUP, COR, SCH, DNC, GEO, RUN. Job Testimonial items are one-time use items!!! If you fail the lvl70 Maat fight, you MUST farm another testimony to be able to challenge Maat another time. Be sure to drop the old testimony before farming another. For more comprehensive information, see this post on the official Darkstar Project Wiki. Some quests and missions require waiting until Japanese Midnight on retail to complete. For HomepointXI, this means midnight Eastern Standard Time (EST). 10:00 am Central Standard Time (CST). 9:00 am Mountain Standard Time (MST). 8:00 am Pacific Standard Time (PST). 12:00 am (midnight, the following day) Japan Standard Time (JST). See https://www.timeanddate.com/ or a similar site for further timezone assistance. Most jobs are available with the exception of GEO, RUN. More Information. HomepointXI features custom commands to enhance your gameplay experience. The !shop 2 command lets you buy Custom Food anywhere in the game. Woodworking, Smithing, Goldsmithing, Clothcraft, Leathercraft, Bonecraft, Alchemy, and Cooking are all available and unrestricted (even on a single character) up to level 110. Synergy is not available, however alternative recipes for some items are listed in the Item Tool. All crafting guilds are always open and provide most common materials. Note that some aspects of guilds still use Japanese time, and cannot be adjusted. This can cause display problems when turning in guild point items. See the Crafting Guides section for more information and guides on various crafts. No procs! See our Dynamis Guides for more information on entering Dynamis. The original Artifact 1 Armor for all available jobs can be purchased for 500gil from the AF Storage NPC in Lower Jeuno or in a multitude of other locations. Various NMs across the world of FFXI have had their levels increased here on HomepointXI due to those NMs being involved with the upgrading of various pieces of armor/weapons or because they drop items that they normally wouldn't in retail. Even if you don't think an NM in the game has had its level boosted, it's always a wise choice to utilize the tools that have been made available for you here on HomepointXI. Your life could depend on it!!! If you on Windows 10, check to make sure DirectPlay is enabled. Control Panel → Programs and Features → Turn Windows feature on / off → Legacy Components → Turn on Direct Play. Your FFXI client may need to be updated. Follow this guide to make sure your FFXI client is up to date. See this guide for solutions to common issues. Help, I'm stuck! How do I get unstuck? Login to your user profile and use the unstuck button under the character. How do I change my character email or password? Login to your user profile and use the account menu, next to logout at top right. From there you can change your email or password for logging into your character. Why did my party lose level sync? Level sync can be lost after killing 1 mob if the synced character has not defeated Maat in Shattering Stars, the quest that removes the level 70 cap. Completing this level 70 limit break quest will prevent level sync from being lost in scenarios like this. Something is broken! What do I do? Ask the in game HomepointXI Linkshell. Experienced players can answer many questions more quickly than filing a support ticket. For HomepointXI game server issues. For [https://github.com/HomepointXI/Website HomepointXI.com website only issues. HomepointXI server tries its best to keep with the latest build of DSP. DSP, in turn, does its best to keep with the latest version of retail FFXI. Depending on when you last performed a file check in POL, your client version may not match the version that HomepointXI server is using. If this is so, you will receive a message, in game, regarding the version mismatch. If your client version is older than the server version, you should perform a version update after first verifying with a GM/Admin. If your client version is newer than the server version, there is nothing that can be done and you must wait for the server version to be updated. For all issues except server exploits, please first reach out to the server community to see if someone else has previously experienced your issue and is able to assist you. If no one is able to, or if at the direction of a GM, please submit a ticket. For exploits, please contact a GM on Discord or in game if they are online.